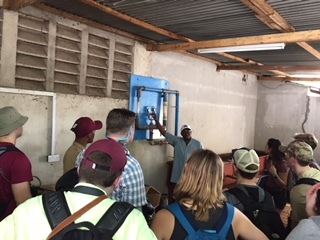 On our first day in Tanzania, we made our first attempts to speak Swahili, visited Trans Africa Water to learn about water pumps, visited the markets for some souvenirs, and enjoyed good food with new friends. 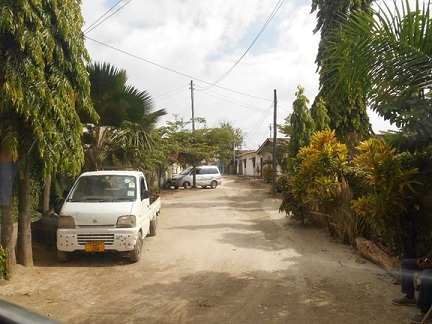 Following our first night in Dar es Salaam, we were greeted by this view at the Wistas Inn and a Tanzanian breakfast of sweet rolls, eggs, fresh fruit and juice, and a local instant coffee. As we shook the jet lag, we were able to make our first attempts at speaking Swahili. The hotel staff got a kick out of our greetings and thanks of "Asante sana" (Thank you very much). This provided some needed confidence and practice for a day that gave us our first chance at conversing with many of the locals! We began our adventure by riding the bus to Trans Africa Water, the regular supplier of the pumps for the ME 3080 program. The staff was incredibly helpful in familiarizing us with the equipment they sold, the potential lifetimes of their products, and how they worked. They even wired up a pump they were repairing to demonstrate the power it had! Staff showed us how they demonstrated equipment they use to test repaired pumps and their pressure and flow capacity. By this time it was nearly noon, so we headed to the Sea Cliff restaurant for lunch where we were treated to an excellent selection of seafood and a view that made us wonder if we can really count this trip as hard work. Following lunch we headed to the carving market to collect some souvenirs and try our hand at bartering. There, merchants pulled us into their shops to show us the craftsmen at work. It is hard to believe that any member of the group did not end up overpaying a bit, as a Tanzanian merchant’s true art form is a “special priced” sale. “Take what they asked you to pay and cut it in half, and you’re still overpaying” remarked Peter, our bus driver, as we left the market. 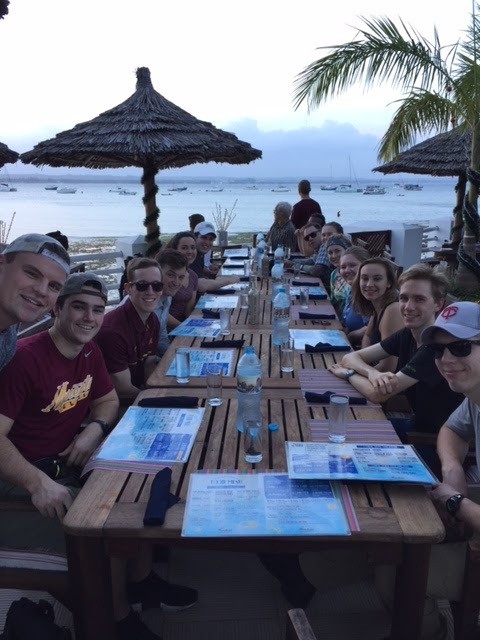 After taking a short nap to fight off the last of the jet lag, we headed to the slipway restaurant for dinner where we were once again treated to an exceptional menu, live music, and our first up close encounter with Tanzanian wildlife, a feral cat looking for scraps around the patio. After finishing our dinner, we grabbed some gelato and headed back to the hotel, wary of the upcoming bus ride to begin at 6:30 a.m. the next morning, but excited at the prospect to experience even more of this lively and beautiful country.